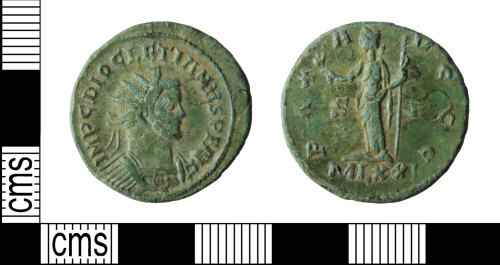 A copper-alloy Roman radiate of Diocletian struck by Carausius dating to the period c. AD 291-292 (Reece period 14). PAX AVGGG reverse type depicting Pax standing left holding branch and vertical sceptre. Mint of London: S P//MLXXI. As RIC V.2, p. 551, no. 5. Reverse description: Pax standing left holding branch and vertical sceptre.